Mulberry Chronicles: New brand: Jam or Pains! You may remember an instagram post featuring a very cute bunny I discovered in a Tokyo market in October. I was able to contact the designer who happily accepted to have her beautiful designs as part of the Chiffon Rose collection! I am very excited to present "Jam or Pains"! 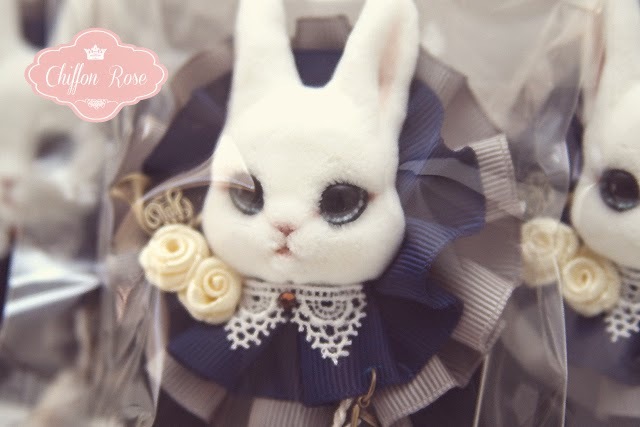 This talented Japanese designer hand crafts adorable creatures on wearable rosettes. She discovered her talent while making soft toys for her little sister. Yes, she makes the toys herself! I am inspired by her creativity and attention to detail. You can look forward to the cutest bunnies, cats and foxes! Jam or Pains blogged about our meeting on yaplog which reveals some of the designs you may see on Chiffon Rose! Please remember that each item is carefully handcrafted and have taken a few weeks to prepare so some designs are very limited! Release details will be revealed shortly.